Illegal Migration – A Way For the Mankind To a Humanitarian Crisis? At all times, people have been moving from one place to another in search of a better life regardless of their nationality or skin color. Someone escaped from oppressions, someone tried to start a new life in a new place from a clean slate, for some people change of place meant enrichment, glory, and honor. Some people had to change their residence against their own will: as a punishment people were not sent to prison, but to exile, forever. Due to the migration waves the great transmigration of peoples took place, which resulted in settlement of Europe and exploring of Siberia and Australia, North and South America. It is impossible to imagine the modern world without migration processes as well, but the problem of migration is unlikely to be perceived the same in all countries. According to the UN data, over 200 million people live and work outside their mother countries. Secretary-General of the United Nations Ban Ki-moon, speaking at the 65th session of the United Nations General Assembly on May 19, 2011, noticed the important contribution of international migrants to the development not only of the countries of their residence, but also to the economies of their home countries. “About two thirds of the 214 million migrants live in rich countries. Their money transfers to the mother countries reach 300 billion US dollars annually. This figure exceeds the flows of international aid”, the Secretary-General said. He stressed that without these transfers even more people would have to migrate abroad in search of better life and money. Mr. Ban Ki-moon noticed in his speech that discussion of the migration issues was frequently concentrated on the problems associated with this phenomenon. Many people say that migrants become an enormous burden on social systems, others are afraid that foreigners will occupy their kids’ places in schools and universities and will take their jobs. “However, statistics show that the migrants’ economic contribution is much higher than any loss”, the UN Secretary-General said. He added that most often “migrants do dirty, dangerous, and hard work”. On the other hand, what arguments will be sufficient to explain to a person who was born, grew up and lives in his country that it is “advantageous” for him to send his children to schools in which their native language is not of use any more because the majority of children in classes are the children of migrant workers (or not really workers)? How can an average citizen be convinced that it is “economically efficient and beneficial” to fire him and hire a dozen of migrants who are now doing his job, perhaps, not so professionally but for much less pay? The authorities of the countries, where migrants come, usually have no answers to all these questions beyond economic necessities. And in this case traditions, culture and lifestyle of a country that has become developed due to the hard work of generations are sacrificed in favor of the notorious economic efficiency. Moreover, modern legislation of most developed countries is so tolerant that any expression of dissatisfaction with the behavior or number of migrants (which is quite normal for native residents) is considered by some political and economical agenda driven politicians as “incitement of ethnic hatred” or “xenophobia”. In some cases, as the consequence of this circumstance, the current authorities lose confidence in their people who start to believe genuinely that the government does not protect them, - citizens that pay taxes, undergo military service and produce national product, - but does protect illegal aliens who often are criminals. We should not forget that not only honest workers go to developed countries: criminal elements and fortune-seekers hoping to enrich themselves through illegal activities also rush there. And the reaction of people in migrant-receiving countries is quite understandable: a hundred of helpful actions made by foreigners will be ruined by a single crime committed by an illegal fortune-seeker. It should also be noted that migration flows contribute to the formation of organized crime groups on a national basis: native population of the developed countries is no longer surprised by ethnic gangs in their countries, and such gangs first begin to make a profit out of their fellow nationals and then they significantly complicate the life of citizens of the country that received them. Countries where the magazine is distributed more or less have difficulties, when it comes to the issue of solving the migration problems. Mostly these problems are common for all of them, but not all of these countries are able to cope with these problems alone. Since the author is a Russian citizen, his country, being a migrants receiving, is taken as an example here. Migration from the former Soviet Union countries is typical for Russia. Movement of citizens within the USSR was a natural process which didn’t result in significant social and economic problems due to several reasons. Firstly, there was no economic gap between rich and poor; living standards were high in all the Union republics. Secondly, there were no language barriers as the Russian language was taught as the national one in all Soviet schools (national languages were taught on an equal basis along with Russian). Thirdly, state policy guaranteed the right of labor and employment, as well as timely and stable payment for work to everybody. Twenty years have passed since the date of the collapse of the Soviet Union and the whole generation that didn’t speak Russian fluently or didn’t speak it at all grew up, which makes the procedure of migrants’ integration into modern Russian society very complicated. Furthermore, the income gap between the richest and the poorest part of the Russian population has considerably grown, which also complicates migrants’ life because the poorest strata of the Russian population consider the flow of workers from abroad as a direct threat to their relatively prosperous life. However, legal migration, in case of at least partial adaptation to the Russian traditions, language, and rules of conduct does not result in rejection reaction. The increasing flow of illegal migrants is considered by the Russians to be the principal threat to their welfare and economic stability. Thus, illegal migration from Central Asian countries (Tajikistan, Kyrgyzstan, Uzbekistan), as well as from the countries of Transcaucasia (Armenia, Azerbaijan, Georgia) is typical for the European part of the Russian Federation. Migrants from Central Asia mostly work as laborers; they clean streets and do other low-skilled jobs. Despite the policy of repatriation of illegal migrants that is being carried out by the Russian government, their flows don’t seem to reduce which is connected with the deplorable state of the economy of Central Asian countries, high level of corruption and low earnings at their home countries. 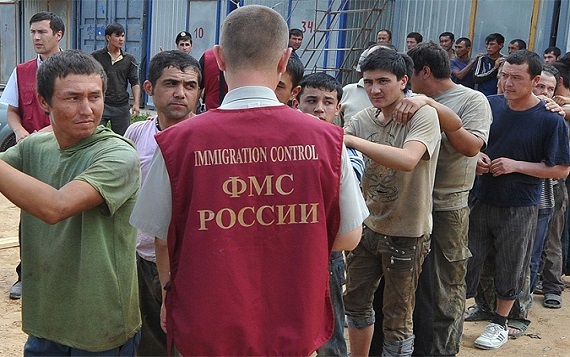 Taking into consideration the cheapness of labor force from Central Asia, employers make an obvious choice in favor of illegal migrants reducing the employment among Russian citizens. Thus, expenditures of private companies connected with labor hiring are reduced, but the quality of work done is affected due to the poor qualification of employees. This creates distrust among customers regarding migrants’ work in general. In additions, the negative public perception of illegal immigrants from Central Asia is overlapped by the problem of the endless transit flow of Afghan heroin into the Russian territory which is then trafficked into Europe. Migrants from Central Asia often take part, directly or indirectly, in drug trafficking. The illegally residing in Russia Caucasians, in their turn, have successfully managed to master the retail trade sector. They also act as middlemen in the resale of agricultural products buying it at a price unprofitable for agricultural producers and selling it at markets at an unreasonably high price. And the markets are generally, to one extent or another, controlled by ethnic criminal gangs from Azerbaijan, Armenia or Georgia. Siberia and Russian Far East suffer from flows of migrants from China and Vietnam who either settle down in groups by tens and hundreds of people in the Russian territory or continue their way to the countries of EU, the same way, in groups. In cases when the Chinese and Vietnamese stay in Russia, they are predestined to work as laborers at construction sites and clandestine factories producing counterfeit goods or work on illegally seized farmlands. In any case, migrants from PRC and Vietnam become dependent on the local and ethnic criminal gangs which extort money from them for the legalization and permission to work or as payment for accommodation, etc. The result of illegal migration to the Russian economy is the reduction of jobs for locals, the growth of corruption among officials, speculatively raised prices, organized ethnic crime. All these factors contribute to the decline in population’s confidence in government. At the same time, the poor methods of migration control encourage transnational organized crime and create social tension fraught with unpredictable consequences. The reasons why people decide to migrate – permanently or temporarily – can be different. It may be a simple desire to earn some money and sometimes it is an attempt to escape from a military or religious conflict which takes place in their countries. In any case, migrant workers face whole lot of difficulties in developed countries. Problems with documents permitting to stay and/or to be employed automatically create problems with the law for foreign workers in a receiving state. It is even worse when lack of required documents makes them illegal aliens and this fact does not allow them to perform skilled work. Thus, there is nothing else these people can do but to agree to such jobs that are ignored by local citizens because of low salaries and absence of career opportunities. The common problems for migrants are miserable living conditions, lack of social security, annoyed reaction of local population to their staying. Another dreadful reality of illegal migration is human trafficking: there is no exact statistics in the world on missing people who went to work to other countries. Transnational organized crime groups take advantage of the fact of the illegal crossing of the state borders and sell migrants into slavery. Facing the negative attitude and being treated like “second class” people, migrants enclose themselves into their diasporas if receiving countries are unable to solve the issue of their proportional settlement among the native population. “Fitting” into the life of a new country is especially complicated due to differences between religion and national traditions. Migrants’ unwillingness to incorporate into local culture and equal lack of willingness from the local population to accept them lead to the rise of extremism and violence, which was vividly demonstrated by the events of the end of 2005 in France (by the way, in 2009 French migrants went on strike again), Belgium and Germany. Taking into account the latest trends, as well as the increase in the number of illegal migrants from North Africa, successful European countries will yet have to face a new round of problems with migrants. Already this year, disagreements at an international level within the frame of the European Union have become the first sign. The ground for these disagreements was an uncontrolled migration wave from North African countries hit by instability. On May 19, 2011, El Universal, a Mexican newspaper, published an article devoted to the problems of Latin American countries operating as transit routes for the illegal migrants eager to get into the USA. According to the publication, more and more foreigners arriving from other continents have been registered in this country in recent years. Mexican immigration authorities arrest citizens of PRC, India, Egypt, Nepal, the RSA, Ethiopia, and Nigeria who use Mexican territory to enter the USA illegally.